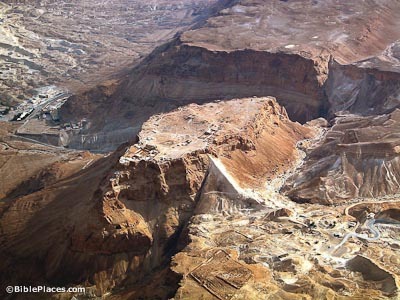 The summit of Masada sits 190 feet (59 m) above sea level and about 1,500 feet (470 m) above the level of the Dead Sea. The mountain itself is 1950 feet (610 m) long, 650 feet (200 m) wide, 4,250 feet (1330 m) in circumference, and encompasses 23 acres. The “Snake Path” climbs 900 feet (280 m) in elevation. From the west, the difference in height is 225 feet (70 m). Fifteen long storerooms kept essential provisions for time of siege. Herod filled with them with food and weapons. Each storeroom held a different commodity. This was attested by different storage jars and inscriptions on jars in rooms. 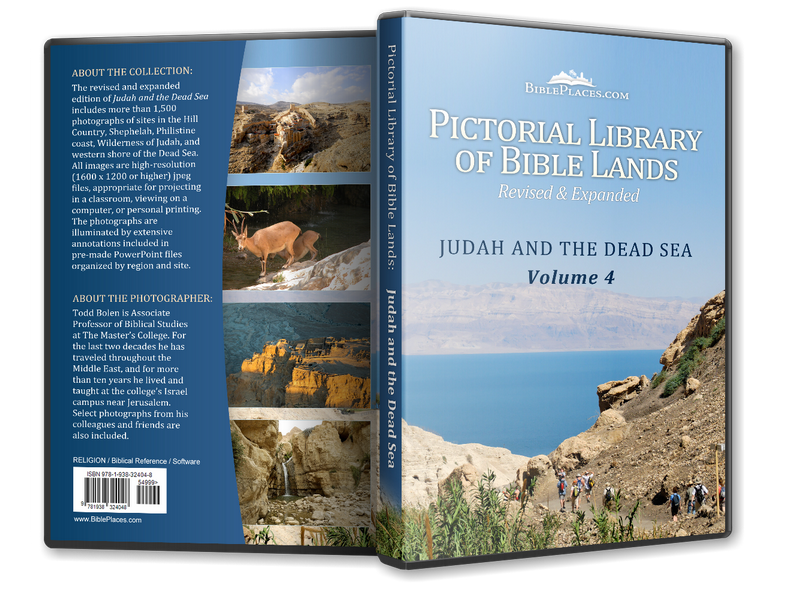 Wine bottles sent to Herod from Italy were found. 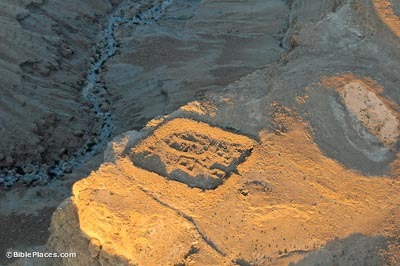 This synagogue was found in the first season of Yadin’s excavations. 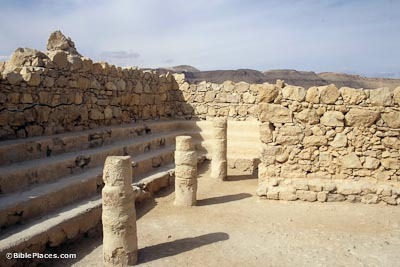 No Second Temple period synagogues were known at the time. Many coins from the Jewish Revolt were found here. An ostracon was found on the floor with inscription, “priestly tithe.” The back room served as a genizah. 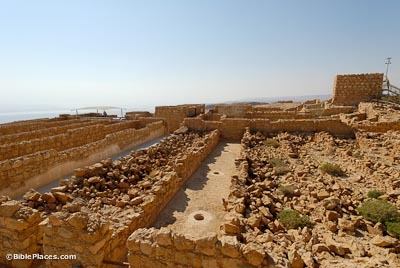 Herod had several private bathhouses built at Masada. 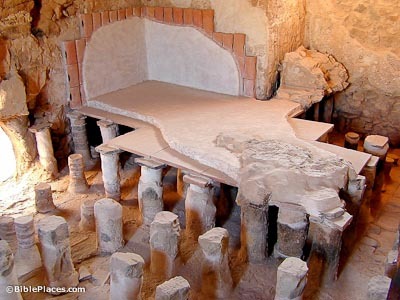 The caldarium depicted here had a heavy floor suspended on 200 pillars. Outside the room a furnace sent hot air under the floor. When water was placed on the floor, steam was created. Pipes were built into the walls to help to heat the room. Investigation of tamarisk branches in the Roman siege ramp result in the conclusion that fifty percent more rain flowed through the wadis into the Dead Sea when Flavius Silva built the siege ramp. The ramp was built while siege engines and armed men protected the workers. Ultimately it allowed the Roman army to access the stronghold. 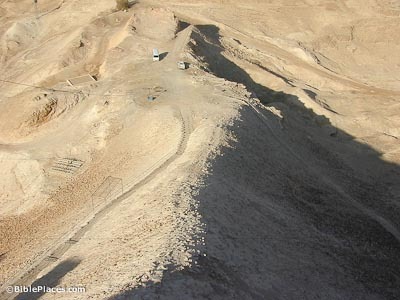 A solid wall was built surrounding Masada and connected the eight Roman camps. It was 6 feet thick and 7 miles long and built to prevent escaping. An estimated 9,000 soldiers plus support personnel and slaves conducted the siege. Szoltan discovered the first Roman siege camps in 1932.